Remember being able to type a document without constant distractions from email, social media and the internet? The typewriter is undoubtedly one of the most important inventions in human history. It was first envisioned in 1714 as a means of recording important documents without a printing press but the first commercial machines wouldn’t arrive for another century and a half! American William Burt built the first Typographer the precursor to the typewriter in 1830. His patent was personally signed by then-President Andrew Jackson. Burt was a government surveyor and built the machine to help speed up his work. He used the machine to type letters but his need for speed remained unfulfilled, as the Typographer used a dial to select letters rather than keys. Many other attempts followed from other inventors, but the first commercial typewriter would not arrive until 1874. Christopher Latham Sholes and Carlos Glidden had their ‘Type-Writer’ manufactured by Remington. Sholes also invented the QWERTY keyboard we use today; it featured on his machine, which wrote in capital letters. The first popular typewriter to bear the familiar design was the 1896 Underwood 1, designed by Frank Xaver Wagner. It featured the four-row keyboard, front key-striking (allowing people to actually see what they were typing) and a shift key allowing for capital letters. It wasn’t the first to offer all of these features, but did so with far superior engineering and, as a result, great success. By the early part of the 20th century, typewriters were becoming commonplace in workplaces but boy were they creating a lot of noise. The Noiseless Typewriter Company began marketing its first machine in 1917. However, it didn’t live up to its billing and failed to sell well. The ‘clickety-clack’ lived on. Electric typewriters, which used a motor to power the type bar, began to gain a little prominence between the World Wars. The first of note was the Electromatic Typewriter. In 1933 IBM bought the company, investing $1 million, and by 1935 the IBM Model 01 arrived as the first successful electrical model. The powered operation allowed for much lighter keystrokes, while keys weren’t as far apart as mechanical counterparts. This meant far less reaching and hammering. 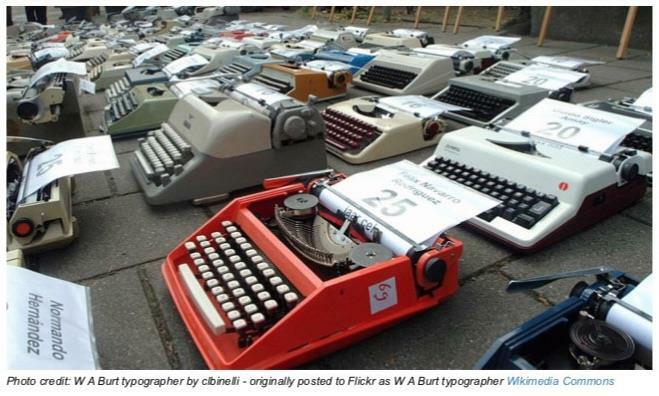 IBM would further improve the design in 1961 with the IBM Selectric typewriter. This model actually looked like a computer keyboard. It featured a rotating golf ball-like type-ball, rather than individual type bars (something that had been pioneered in early mechanical machines). The ball could be easily replaced to enable different fonts, italics or languages to be used in the same document. It also eradicated jamming. In 1964, IBM furthered the design with the Magnetic Tape Selectric Typewriter, which was, in effect, the first ever word processor. It introduced a magnetic tape system for storing characters which meant that for the first time documents could be edited and reprinted, rather than having to retype the whole thing. It promised error-free typing at speeds of 150 words per minute. The 1969, the Mag Card Selectric Typewriter allowed written information stored in Mag Cards to be sent to other machines over voice-grade phone lines. Essentially, this was an early version of email. IBM remained at the forefront of innovation in the sector and in 1971 brought out the sequel Selectric II. This introduced a correction tape, which eliminated the need for correction fluid: once the new correction key was struck, the correction tape was able to ‘lift’ the ink off the page. The final Selectric III went on sale in the 1980s. Although countless further innovations, from companies like IBM and Brother, would allow typewriters to remain relatively prominent for another couple of decades, they had already begun the transition into word processors before computers began to invade homes and offices in the 1980s. The last Brother typewriter rolled off the production line in 2012. Some typewriters remain in use, even today, with many writers choosing them to avoid the distractions of the internet. The great gonzo journalist, Hunter S. Thompson, stuck with his until his death in 2005 and there is still a great market for antique typewriters. From the above, you can see that the ‘clunky’ typewriter has evolved into the modern day streamlined computer, in an on-going quest for improved efficiency. In today’s IT and computer based world, the art of using these devices remains more prevalent than ever. Secretarial banks have all but disappeared, whilst the use of these devices have become the standard in offices, schools and homes worldwide. Their usage is not expected to decrease but increase. Inspite of all software and hardware development, by some of the largest companies in the world, PC’s and laptops are still sold with a keyboard – making the ‘skill of touch typing’ priceless and essential. However, in a busy and time sensitive world, all software needs to be simple, easy, quick and effective. KAZ’s typing software meets all of the above requirements. Its unique accelerated teaching method has proven to teach the a-z keys in just 90 minutes and its inclusive features makes it suitable for both mainstream and neurodivergent individuals.